A Brussels judge may block access to all Apple websites in response to a complaint filed by Federal Public Service (FPS) Economy, reports Belgian newspapers (Via Tech.eu). Apple is accused of misleading consumers about warranty protections available for products purchased from Apple's retail and online stores. 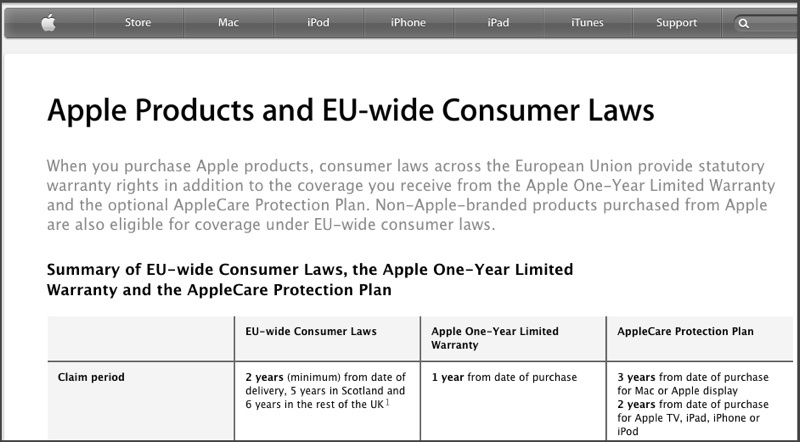 The complaint, filed last year, claims Apple advertises its one-year warranty and extended AppleCare warranty, but does not inform consumers of their right to a two-year statutory warranty under EU law. In response to this claim, Apple painstakingly outlined the differences between the company's standard one-year warranty coverage, its AppleCare extended protection plan and the EU's two-year warranty, but the website comparison was not sufficient for the Belgian regulatory group. The Brussels investigative judge can order Belgium ISPs to blacklist Apple's website as Belgian law allows for the regulation of electronic services in cases where consumer protection rights are being violated. Though he has the power to block Apple, the judge is unsure how to proceed as blocking Apple's website also interferes with critical iOS and OS X services like iTunes and iCloud. Consumer associations throughout Europe continue to be critical of Apple's warranty policy in its European stores. The company was fined $1.2 million in Italy over the issue and has faced lawsuits in Germany, Luxembourg, and Portugal. That webpage is not from the Belgian apple site, but from the UK or european version. The belgian pages are only in dutch or french, and as far as i can see, only mention the 1 year apple warranty. Looks clear to me. Does the Belgian regulatory group suffer from a lack of reading comprehension or are they trying too hard to be more nanny? To me this falls into the "get a life people". If a consumer/regulatory body is that worried about the EU 2 year warranty, then the EU regulatory body should tell companies exactly what they need to display instead of letting a business "guess" how detailed they need to be and then pull this crap. Well, since everyone in the EU loves their consumer protections so much, why not just build a 3-year warrantee into all Apple products sold there, and raise the base price to reflect that. The web site comparison looks pretty clear to me. This is already built into the base price which is one of the reasons why we pay quite a lot more than in the US for Apple products. The whole thing is ridiculous anyway as it is perfectly clear on the website what consumers are entitled to in each country. Reads like by EU Law Apple must provide at least 2 years of warranty support. So why does Apple even point out 1 year? You think consumer protections are a bad thing? With the price Apple charges for it's products a two year warranty should be included at purchase. The vendetta is more than just against Apple, however. Europe seems to have a thing against large successful American tech companies. Microsoft was harassed to death when they were the king of the tech sector. Maybe if they paid their Taxes they would not get harassed as much. It's pretty simple. It's not a vendetta against Apple, it's about applying the law. Now some people say that somewhere on the website it is stated that there is indeed 2 years of warranty. This is true, somewhere deep into the small characters (but yes, that's where we expect warranty details to be anyway). However, being from Belgium (and paying my phone about 30% more than I would if I was in the US... My iPhone 5S 32GB costed me USD 1100! ), I expect that 2 years warranty to be apply. But strangely if you go into an APR (we don't have ARS in Belgium yet :( ), vendors are advised to tell us the warranty on Apple products is only 1 year. If you go on the chat of Apple's website, they will still tell you that the warranty is only 1 year and that therefore your purchase (phone, computer, etc) is not covered by the warranty and it will cost that much. This is before having even looked into the product to see if this is actually a defect from the manufacturer. So, in simple, this is why that judge or whoever is doing what he is doing, considering blocking Apple's website until they respect the law, law that in itself is not crazy... It's not like Belgian laws require Apple to give a free refund for 2 years. It is just requiring Apple to cover product defects for normal usage on a period of 2 years, and not mislead the consumer in mentioning it is only one year (mainly their representatives in this case).